Click here for my Christmas Card Challenges post. 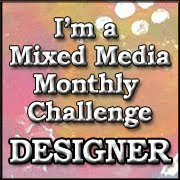 It's finally time for our first challenge over at The Mixed Media Monthly Challenge Blog. I'm hosting the challenge this month and our challenge is to use Spray Inks or Mists on your Mixed Media Project. I made an art journal page using Dylusions Spray inks. To see how I created this page check out my tutorial over on the MMMC Blog. 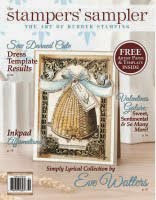 Our sponsor this month is Inspiration Emporium and our Guest Designer is the fabulous Shelly Hickox. Be sure to go check it out and I hope you will play along with us this month. You have until June 30 to enter. 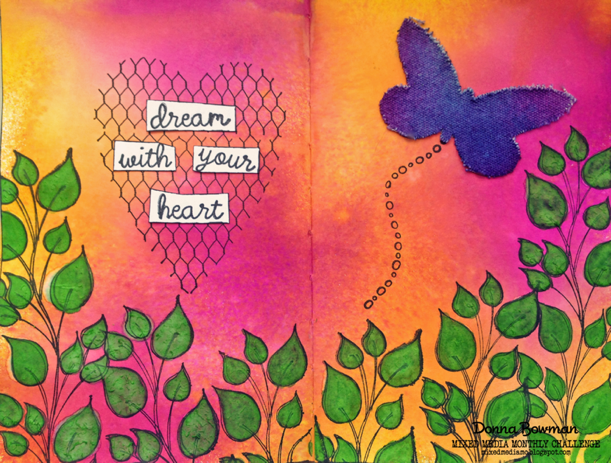 Beautiful art journal pages. The colors are so vibrant and the leaf stamp is one of my fav's!! Great MMMC launch and I'm so happy to be a part of this amazing team! 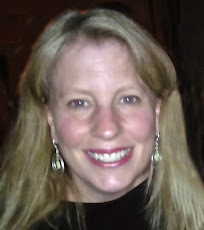 your page is beautiful, donna! you seem to blend those inks perfectly every time! happy MMMC #1!!! yay! 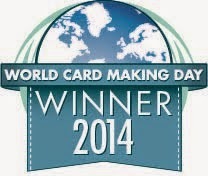 Your card is so vibrant and beautiful! I love every detail, right down to that wonderful butterfly! I love the bold colors and the smooth blending effects you achieved in you page, Donna. I can't wait to play with my sprays this coming weekend and hopefully have a page worthy of sharing in your new blog. Blessings! This is so gorgeous. What stamp did you use for the leaves?